If you have any specific requirements please select your foot type and we will contact you about your custom order. 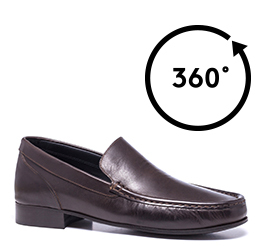 Height increasing loafers, handcrafted with fine upper in Cordovan leather in a dark brown colour. A rare and precious leather characterized by its natural grains. A shoe with 2.6 inches (6.5 cm) invisible elevator system ideal to enhance any outfit.